You are only assured of your rabbit’s safety if you have the best rabbit house. Are you confused about finding the perfect hutch for your rabbits? Finding the right one for your pet’s use can be such a tough task. If your pet has ever run away and went missing or was attacked by predators, or died due to poor ventilation, you will understand why it’s important to get the correct hutch. Several things come into play while choosing a rabbit coop. One of those things is the size of your rabbit and the space you intend to keep the hutch. Another important feature is durability. You should consider a hutch that is made of a material that will last longer. The rabbit coop should also be strong enough to withstand scratches and protect the rabbit from predators. It should also be easy to access your rabbit at any time mostly during emergencies. For this, you need to consider the location of the doors and whether the roof can be opened. In this article, we have put all the above features into consideration and we have come up with the best rabbit hutches in the market today. Most of them have desirable features that will ensure your rabbit is happy and safe. For each bunny hutch, we have included its advantages and disadvantages. This will help you compare and eventually choose the best hutch that would take care of your needs and those of your rabbits. This is a spacious bunny hutch that resembles a cottage. It can also be used for other small animals. It is made of non-toxic auburn and white color. It is safe and comfortable because it is like a nesting box. This rabbit home is made of fir wood and wire mesh, so it is strong and durable. It can be used outdoors because it is waterproof. It is fast and easy to clean because of its three built-in metal sliding trays. It also has three doors. This makes it easier to access your pet whenever you need to. The hutch is easy to assemble. The wood is exposed, so the rabbits can chew it. The ladder is steep and the entrance door is small. It has a strong scent while still new. 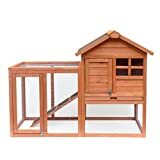 This wooden rabbit hutch is 61 x 24 x 27 inches, and the width includes the roof dimension. It is made of fir wood with color stains. The doors are made of multiple designs and has a roof made of asphalt. The roof of the main house can be opened. This makes it easier to access your pet. The roof is green and the woods are of natural color making it a great fit for your garden. This hutch is spacious and with a warm resting room. It is easy to clean since the tray can easily be pulled out. It makes it easier to access your pet. Heavy odor when first put together. Pets can easily chew the woods. This is an outdoor rabbit home made of fir wood. It can also be used for other small animals. The living area is spacious and safe because it is made of a strong wire. The hutch has a living room area, running area and two sliding pans that are easy to access. It has a ramp that helps in moving from one level to the other. The ramp has timber rides that prevent your rabbit from sliding backwards when moving up. 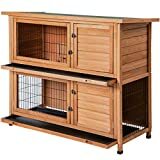 The design of this hutch is simple since it is made up of two cages put together with a door that provides easy access to your rabbit. It has a length of 48 inches, 19.5 inches wide and 41.25 inches high and a weight of 33 lbs. It takes less time to assemble the hutch. It is made of nice and durable hardware. It can only be used outside the house. This is the best rabbit house because it is made up of two layers of high quality that are very spacious. The space is large enough to allow rabbits to play and rest. The pets are also able to exercise freely in this hutch with no possibilities of accidents because of the strong wire mesh used. The large part of this hutch is made of the iron wire grid. This makes it easier for you to monitor your pets. The hutch is also durable because it is built with a pine wood frame that is of high quality. It has two pull-out trays that make its cleaning easy. There are also two ladders that are easy to climb. The ladders help the pets to access the upper floor. The sleeping area is perfect because it is comfortable. It is easy to monitor pets. This bunny hutch is spacious and comfortable. It has a low footprint and compact design that makes it fit for smaller spaces. It has an enclosed area at the corner to offer privacy and rest while the other area is large to enable pets to play. The hutch also has a side door and a top that can be opened for easy access. This makes it easy to clean and feed. Thisrabbit home is made of fir wood and composite asphalt roof making it durable and weather- resistant. It has a length and width of 63.75 inches and a height of 24 inches. The wires are spaced tightly to protect the pets from predators. The hutch comes in three different colors brown, black and white. This is a large rabbit hatch that has a compact footprint. This makes it fit well in smaller spaces while giving enough space for pets to play. The wires are tightly spaced to protect your pets from predators. 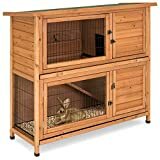 This hutch has a top section that can easily be opened and closed making it easy to clean and feed the pets. It is weather resistant and durable because it is built with a weather resistant fir wood and painted with a coat that is also water resistant. It is 47 inches long, 39.5 inches wide and 16.75 inches tall. Another amazing feature of this rabbit coop is that it can be folded making it easy for transport and storage. It is white in color and weighs 36.3 lbs. It is well roofed to protect any rainwater from getting in. It is weak and can easily be broken or bent. 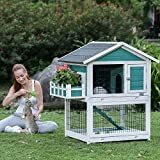 This rabbit house is built with durable fir wood which makes it last longer with little maintenance. The wire is coated with a durable coating that ensures the hutch does not rust, corrode or fade. The asphalt roof protects water from penetrating and from excess sunlight. It is a hutch with a run that is well-designed with a separate sleeping and resting areas. It is spacious to allow pets to play and exercise on a covered ground. It also has a ramp to allow pets to access the upper floor which is the sleeping area. A door that separates the levels is also another great feature of this hutch. The roof of this hutch is hinged so it can easily be opened and closed. This makes it easy to feed the pets, clean, and easy accessibility to pets. The door at the sleeping area locks securely. There is also another wire-door upstairs and another one below made of wood. This keeps pets safe from predators. This hutch is easy to clean because it has a sliding pan that is removable. The doors are also strategically placed to allow quick cleaning and accessibility. It is 48 inches wide, 19.5 inches deep and 33.5 inches high, with the roof closed. The pets can be accessed easily in this hutch. The plastic tray can easily crack. It is difficult to pull the trays out. Pets can chew the woods and cause damage. 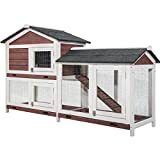 This outdoor bunny pen has a length of 48 inches, a width of 19.7 inches and is 41 inches high including the roof. It is built of stripped wooden planks, thereby preventing the wood from being chewed by the pets. It is separated into two rooms with each containing a tray. These trays can be pulled out, making it easier to clean. This rabbit home is made of fir wood. This makes it strong and durable. This hutch’s roof is waterproof so you are assured that your pets stay dry. It contains four doors which have locks to increase security. It is also spacious to allow pets to play and exercise. It is easy to clean because the trays can be pulled out. It is made of fir wood so it is durable. It is waterproof; this keeps the rabbits dry all the time. Security is well catered for because the doors can be locked. It is spacious, allowing pets to play around. It does not come with clear instructions for assembling. 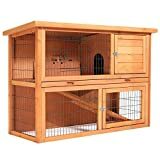 This is a hutch for rabbits and other small animals. It is built with cable ties and pieces that are anti-slip. The cable ties are used to build doors and ramps and also the whole structure. 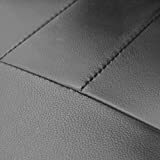 The anti-slip pieces are used in preventing connectors from slipping on the floor. It is DIY expandable. It is, therefore, easier to expand the structure or create multiple layers. Creating a large space helps your pets to play and exercise well. It can be used for climbing animals as well. All you need is to increase its height by buying another set of the hutch. 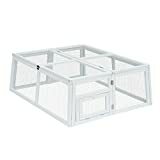 This cage can be used to keep various animals including guinea pigs and hedgehogs. It is transparent to help you monitor your pets. It is easy to set up this hutch and it comes with illustrated instructions and mallet. To come up with features like doors or ramps you need to use cable ties. You can be able to monitor the pets when using this hutch. It can be used for various types of pets. For climbing animals, you will have to buy two sets. The connectors do not connect very well. It can easily be broken open by pets. It falls off at times and can also slide on the floor. This is a wooden rabbit coop made of an asphalt roof which keeps the pet house dry. The roof can easily be opened and closed, thus cleaning the house becomes easy. The hutch is constructed in a running design in order to give pets more fun. It is very attractive with its white and green colors, making it blend easily well with the décor in your home. It contains three doors that are locked using a metal. This ensures security and protects the pets from predators. The pets are also easily accessible from any point. It has a length of 31.5 inches, a width of 26 inches and it is 46 inches high. The entrance is big enough to allow pets to run in and out of the house. It is flat packed and takes less time to assemble. The wood used to make this hutch is natural cedar and the paint is water-based. The wooden pieces fit together well and the wires are strong so they cannot be chewed by the rabbits. This hutch is spacious to allow pets to play freely. It also offers a pull-out tray on each level making it easier to clean. It is beautifully designed with well-thought of colors. It blends in well with the décor in your home. Its design allows you to access the pets with ease. It is easy to clean the hutch using the roof which can be opened and closed. It is cannot be moved around because it is heavy. Sometimes holes are not drilled in the right places making it hard to assemble. The pets can chew the woods and with no time you will be required to replace the hutch. It does not come with clear instructions for setting it up. It is mostly designed for indoor use only. 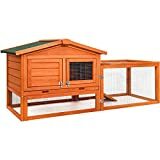 With all these rabbit hutches available in the market today, it is hard to decide on the one that suits your needs. Having proper knowledge on a number of hutches that you can choose from is very helpful. For instance, you should know the rabbit hutches that should be used outside and the ones that should not. 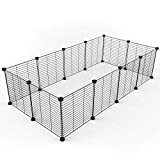 Whether you have used a cage before or not, it could still be difficult to choose each time you are considering buying one. If you want a high quality hutch, do your due diligence to avoid any disappointments. An enclosure for your rabbits ensures that they are safe from any kind of predators. The ones made of strong metal and wood are the best because they will last longer. Replacing a bunny hutch now and then involves incurring costs that could have been avoided. It is also good to consider the number of rabbits you intend to put in the hutch when shopping for one. For instance, if your hutch is to be used for two rabbits then you need a medium-sized hutch that has enough space for resting and playing. For hutch weather to be conducive for your rabbits, a good rabbit house is important. It should have proper ventilation and a good roofing to ensure that your rabbits are always dry. Remember that if the rabbit coop is too small, it may render it too warm and the result would be a lot of discomfort to your rabbits. With proper considerations in place, there is no way you can blindly pick a hutch. 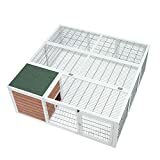 It is so distressing to buy a rabbit house and later realize that you cannot use it because of various features. You may consider returning it to the seller which will come at a cost. To avoid this, review each hutch available in the market carefully before purchasing, but also at the same be ready to compromise on some features.